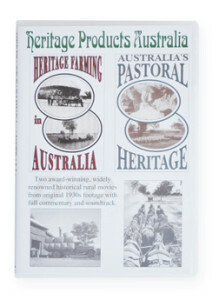 Released in January 2006, this 2-disc set incorporates the footage from both videos: “Heritage Farming in Australia” and “Australia’s Pastoral Heritage”. Click on “Farming Video“ or “Pastoral Video“ for description of the footage on each of the DVDs. The DVD set offers great value, being a far lower price than the VHS video set of the same footage.